Inspired by thickened stone walls of Chaco Canyon and the regional geology the La Tierra Nueva home is influenced by the vernacular architecture of Santa Fe and northern NM. The custom residence is notched into the juniper-studded hillside outside of Santa Fe NM. 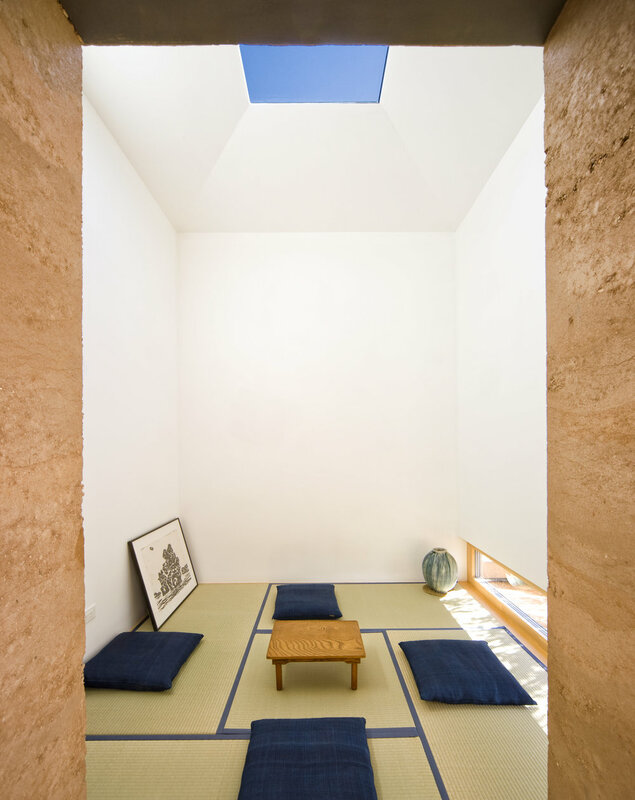 Material choices for the house are informed by Northern New Mexico’s traditional building materials, such as mud plastered, site cast adobe and corrugated metal in addition to colors and textures found on the site. Rammed earth walls, analogous to historic mud plastered adobe walls, match the coloring of the site soil and the zinc walls and roof, analogous to traditional corrugated metal that has dulled to non-reflective, match the colors found on the site in juniper bark, sage branches and cholla skeletons. The homes exterior windows and door frames will also match the earthen gray tone of the zinc with a matte finish. The roof has substantial overhangs sheltering the structure from the elements and shading the home’s glazing from the high desert sun. The folded roof planes mimic the rolling hills of La Tierra Nueva. Rainwater harvesting funnels water from the roof’s valleys to concealed gutters and on to buried cisterns. Captured rainwater is then used to reestablish and irrigate native plantings around the home.